cringeMachine was an early prototype for an interactive public installation. The purpose of the project was to develop a sculptural, crystalline-like aggregate form that could be used to experiment with modular interactive systems and study their effect on public space. We also wanted to explore people's reactions to its rudimentary agency. 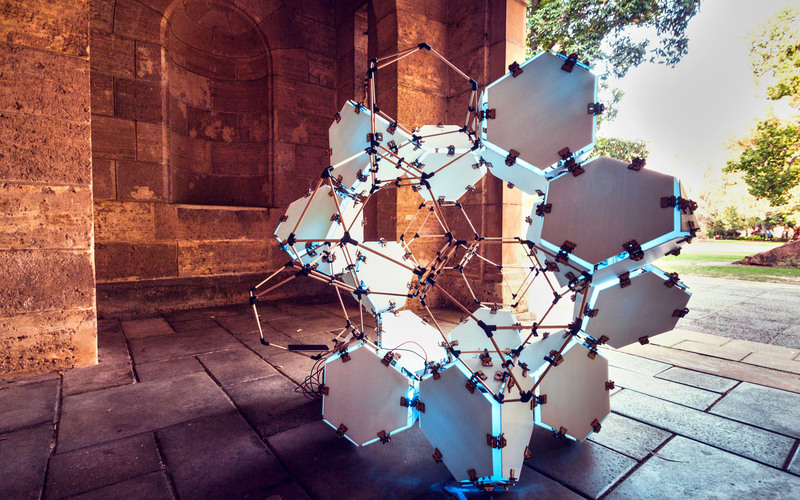 The sculpture incorporated a speaker, a sound sensor, and a simple Arduino circuit connected to linear array of LED lights, which reacted to sound levels around it in real time. This installation is evocative of systems in nature that develop from simple rules and behaviors to create an effect that is greater than the sum of its parts.